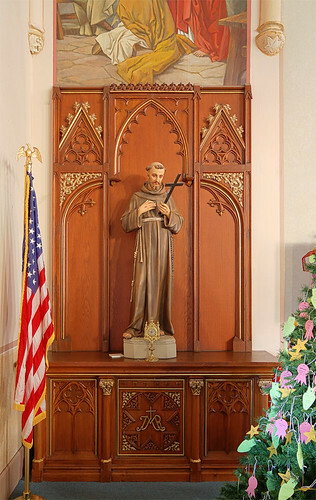 HERE ARE PHOTOS of Saint Francis of Assisi Church, in the village of Aviston, Illinois. 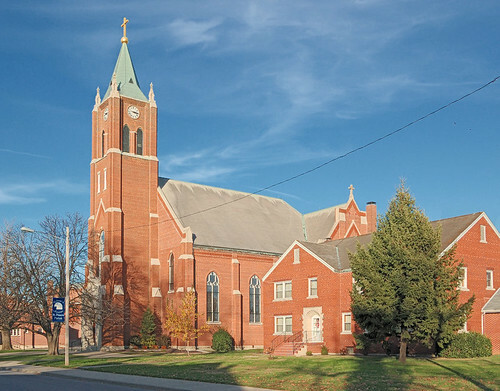 The church is located approximately 36 road miles east of downtown Saint Louis, in Clinton County. These photos were taken on the eve of the first Sunday in Advent. The late-afternoon sun illumines the church and rectory. The first Catholic settlers in the territory of the present St. Francis Congregation of Aviston were emigrants from Northern Germany, Hanover, Westphalia, and Oldenburg. Among them were Bernard Huelsmann (1839), Diederich Overbeck (1841), Herman Henry Markus, Gerhard Feldmann (1848), Bernard Wempe, Henry Stroot, Henry Merscher, Herman Robbe, Carle Stuever (1849). They engaged in farming and by hard and persevering labor and by the practice of rigid economy converted the wild and weedy prairies of the region into rich and fertile farms. 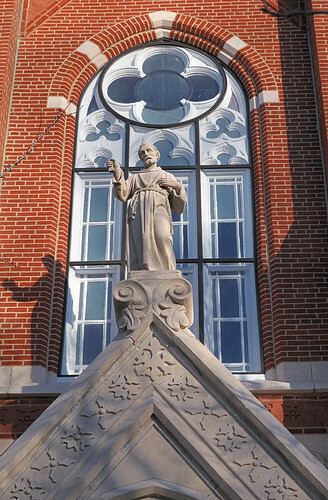 Statue of Saint Francis of Assisi over the front door. 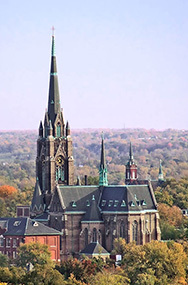 St. Francis Church was solemnly consecrated by Bishop Janssen October 26, 1892. The high altar. 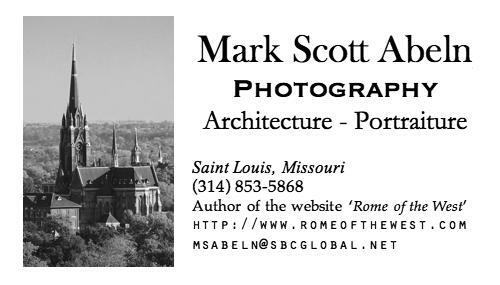 Click here for another view. A closer view of the tabernacle. Altar of Saint Francis, with relic. 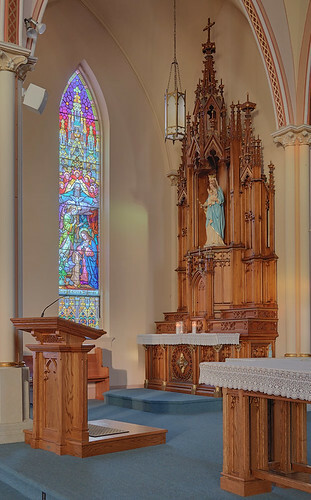 Altar of the Blessed Virgin Mary, with stained glass window of the Annunciation. Altar of the Sacred Heart of Jesus is below a painting of Our Lord with the two disciples at Emmaus, who recognized Him at the breaking of the bread. 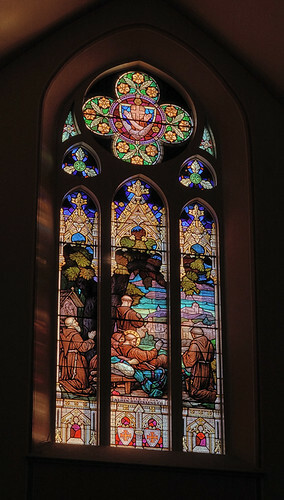 Stained glass window, which likely depicts the Transitus of Saint Francis. Francis blesses Assisi before his death. Window of the Wedding feast at Cana. Sixth Station of the Cross: Jesus meets Veronica. 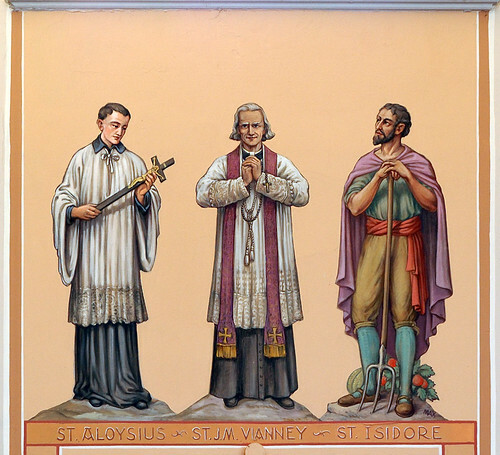 Saints Aloysius Gonzaga, John Vianney, and Isidore the Farmer. 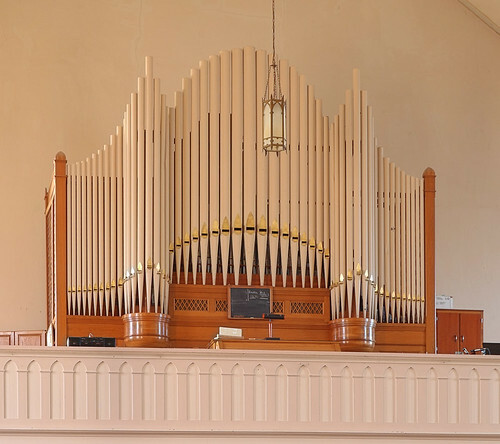 Pipe organ in the choir loft. Click here for other photos of churches in Clinton County. Perhaps you have said before but do you know the name of the style of architecture used in this high altar? 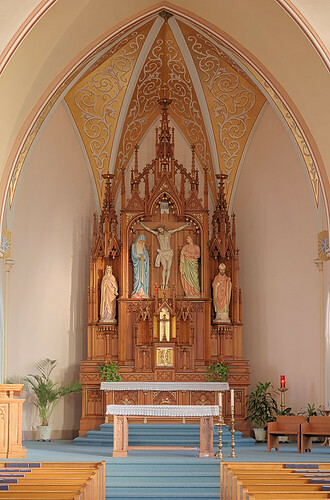 When I was very young I attended St Columbans in Chillicothe Missouri and it has a similar looking altar. 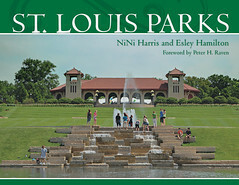 That city too was originally settled by Germans. The High Altar is in a Gothic style, but there are many regional and historical differences, of which I know nothing! These look like altars made by the E Hackner Altar Company of LaCrosse, WI. You can learn more about the company and its works by doing a search under Hackner Altar Co of LaCrosse, WI. 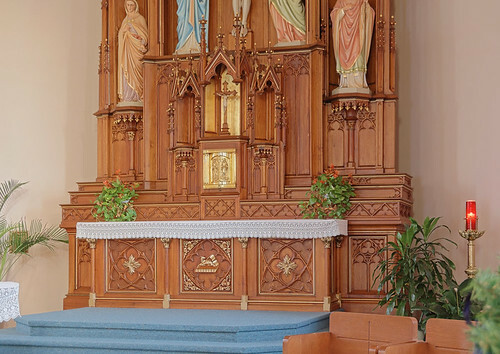 The story of the altars is they were made in Europe, shipped to the midwest for use in another church in the region but (for whatever reason) were rejected before being purchased by the parish. 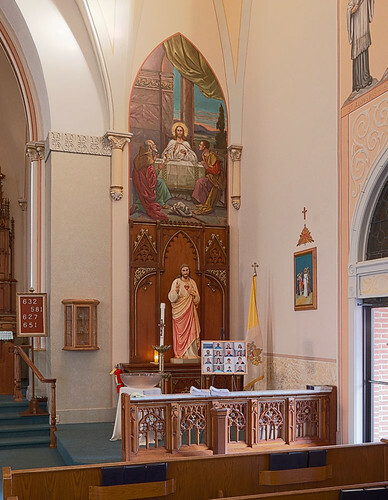 St. Francis completed an interior renovation of the church in the Spring of 2013.